And so it goes, the bright leaves of autumn must fall, and after them . . . I always fantasize that we will have a magical first snow, big fat fluffy flakes that land on my mittens and sparkle. The kind of snow that makes me want to turn my face to the deep evening sky and laugh, catching sparkles on my tongue. Oh well. Here it is, and we will make the best of it. We have already been out and about. 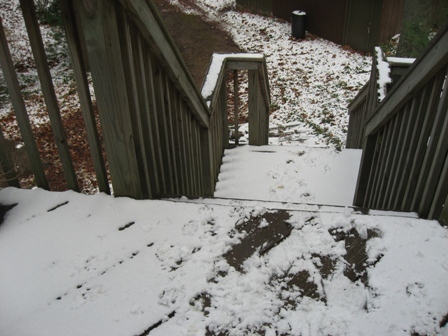 You have seen these steps dusted with snow so often that you are sick of them. Imagine how we feel. But we feel compelled to make the diary entry. Miss Sadie and the Cowboy were shocked to learn that they could not go for a ride in the rental car. Then what is the point of having it? they asked. Good question. The best answer is that while I might walk two miles to the nearest available purveyor of excellent treats, I will not walk back carrying a 22 pound bag of kibble. 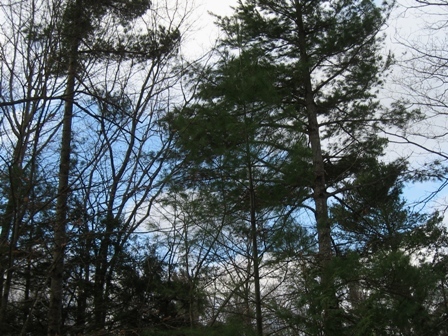 At least the howling wind has stopped, and the temperature is in the balmy high 30s (F). There is a patch of blue up there, promising better things to come. We’ll hold you to it, Mama Nature. We have lots of things to get done today. GACK!! I am very sorry to hear that. There’s really no defense against these sudden twists of fate, is there. Onward, in solidarity indeed. It appears that Kathy ( your neighbor around the lake, yes?) got quite a bit more of the white stuff! I was just over at her place having a look. My dogs were quite happy with the little dusting we got last week (it melted the next day), but I don’t share their joy. You are right, we did not get much, and most of what we did get is gone. North of us there was more. Farther north of us was a lot more. Our neighbor Kathy, who lives way up on the shores of Lake Superior, probably got a whole lot more. I really need to get out there and get rid of the last bits before it freezes into ice. Maybe I’ll have a little cookie first. Three words: Fireplace, pizza, beer. I gotta start thinking ahead more. I never will tire of snow on your steps. You and a few others are my link to that magical, sparkly world. Of course I understand it also can be a sloppy, slick, nasty world, but I’ll happily commiserate and look at pictures of sloppy, slick and nasty for the pleasure of the magic. Two other words: hot chocolate. Or, mulled wine. But best of all are the five words: my dad’s hot rum punch. We always made a batch and kept it in Mason jars in the refrigerator, heating up a cupful as necessary. I am put in mind of an April visit from Mom and Dad back when we lived in Detroit and they lived in Los Angeles. It snowed. The nerve. But Mom was in heaven. She grew up in northern Wisconsin and missed snow. Out she went to shovel the front walk. She had a ball, but did think it was too bad no one brought her a cup of cocoa. My neighbors ribbed me unmercifully about putting my mother to work shoveling the walk. I miss Mom and the neighbors and that house. Oh Gerry you have made me smile while I have tears in my eyes. I had a visit from my folks too, long after they had moved to AL. They came up for Christmas the year before they died. They stayed about 4 days, said it was cold and went home. I did not, however, see them shoveling any of the snow. I miss them too. I do not ever get tired of seeing your snow covered stairs either. Isn’t it something, the way that one simple little thing triggers another and a whole spool of memory unreels? I might have to start looking at the stairs in a new way. Thank you for visiting. What about a rental car company just for dog owners? Or a rental car company with a few cars designated as dog-carrying cars? This would be kind of on the order of smoking rooms in motels–you wouldn’t have to have a dog in the car, as smoking is not obligatory in rooms where smoking is permitted–but surely there are enough dog owners needing rental cars to make the option worthwhile. This was all Sarah’s idea. I’m just passing it along. Our snow was all gone by afternoon except for patches in the woods. Sky was clear and sun bright. You, too, I’m sure. It was beautiful, but I’m not in a big hurry for more, either. Maybe by late December, eh? The car rental company did not, so far as I know ban the Duo–although they did present me with a four-page closely printed contract to sign before they would give me the keys, so I’m not positive. The banishment was my idea. I know that I will be charged for unusual wear and tear, and the Cowboy is able to accomplish that all by himself even when he’s being good. We can manage for a week. We are taking extra nice walks right around the neighborhood. If this were going to go on for much longer, I’d have to investigate my options. Sarah is, as always, full of good ideas. I love going to hotels that permit pets in the rooms, or at least some rooms. I went to a mediation conference in Lansing and was able to take the Duo along. They were treated royally, and returned the courtesy. This is another one of those cultural references I don’t get, isn’t it. Google doesn’t get it either, which was some comfort, but I’d rather be one of the cool people. You’ll have to explain it to the old bat. You can’t tell from the angle of the photo, but the little silver rental car is not a Buick. 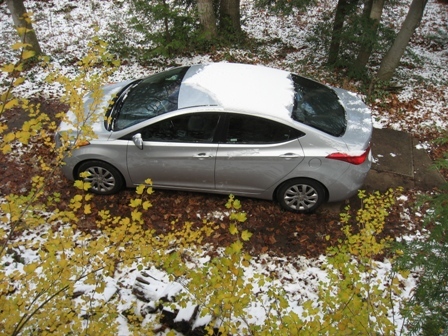 It is a Hyundai Elantra. The controls baffle me, as they are all in different places than the ones I’m used to. This depresses me, as I like to think of myself as an adaptable person. Ha. It is only my malicious, nasty side that causes me to tell you that it got up to 18 C (68 F) yesterday on the eastern shore of Nova Scotia. No, it is your mischievous side. Mama Nature will pay you back anyway. It is a cultural reference which is only found here. So it is of the culture of Torch Lake Views, and no where else. That is, it was fresh. Yeah, I guess It got confused on the Buick reference. It didn’t look a lot like a Buick to me, but I don’t think I see many Buicks around these days. I like thinking of TLV as fresh. I don’t believe there are too many Buicks around these days, but as I got a very favorable deal on this one quite some time ago and see no prospect of replacing it any time soon, there will be at least one in the Township for the foreseeable future.